A woman was yesterday arrested during an alleged attempt to mail cocaine to Canada. But Oneka Tomika Neils, 20, of Lot 612 Half Mile, Wismar, Linden, told Magistrate Judy Latchman that she collected the box in which the drugs were hidden but did not check its contents. Neils, a sales representative, denied the narcotic-trafficking charge read against her at the Georgetown Magistrates’ Court just hours after her arrest. She was refused bail and remanded to prison. The allegation against Neils is that on August 9, at the Guyana Post Office Cor-poration (GPOC), George-town, she had 1.100 kilogrammes of cocaine in her possession for the purpose of trafficking. “I did not know what was in the box,” a tearful Neils said. She told the court that she had received a slip of the items which were in the box, but did not open to check. But Customs Anti-Narcotics Unit (CANU) Special Prosecutor Oswald Massiah pointed out that the young woman had travelled all the way from her hometown in Linden, where post offices are also located, to use the GPOC main office in the city. CANU’s case, according to Massiah, is that Neils travelled to Georgetown with a male companion, whom she claimed had given her the box to post and left with the instruction that she call him when she was finished. He noted that although the woman said she shared a relationship with the man for about a year, she was unable to provide his full name. He added that while a “call name” for the individual was given he did not want to reveal it as investigators are still working on that aspect of the case. Massiah told the court that during the processing of the package for shipment, a CANU officer attached to the GPOC was asked to check its contents and this led to the unearthing of the cocaine concealed among chunks. The prosecutor said that the box contained food items, including transparent plastic bags with the label “chunks” written on them. He said that the bags with chunks were unusually heavy and that a whitish substance appeared to have been between the brown coatings of the chunks, prompting the officer to make further checks. Massiah said the suspected illegal substance was tested, weighed and amounted to 1.100 kilogrammes of cocaine. As a result, Neils was then told of the offence committed, arrested and charged. 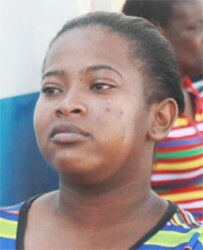 The prosecutor made a successful application for the young woman to be remanded to prison. The case will be called again on September 1.